Interview by Jessica Chastain. Photoshoot by Peter Lindbergh. It's been almost six years since the release of the last Harry Potter film, and still it can be difficult for people to separate Emma Watson from Hermione Granger, the character she played in all eight installments of the hit franchise, from the time she was 11 until she was 21. Maybe there's a reason for this. In the "fantasy" that she says became her life and the lives of her co-stars, Watson, like Hermione, has displayed unbridled passion, natural talent, and—thank goodness for us—a defiant determination to do things her way. Whether that has meant taking time away from a white-hot film career to pursue a degree from Brown University or addressing the issue of gender inequality at the U.N. General Assembly, in her role as a U.N. Women Goodwill Ambassador, Watson has been steadfast in her authenticity. And if she's made some mistakes along the way, as she insists she has, they haven't been onscreen for us to see—certainly not in her two stunning post-Potter films The Perks of Being a Wallflower (2012) and The Bling Ring (2013), which gave us tiny glimpses of her future in film. That future is now here. In March, Watson played Belle in Disney's live-action reboot of Beauty and the Beast, and she can currently be seen opposite Tom Hanks in the surveillance thriller The Circle, based on the novel by Dave Eggers. If the former was a return to the magical universe in which we first met her, the latter has given Watson the welcome opportunity to question how we live today, in the real world. As she tells her friend, the two-time Oscar-nominated actress Jessica Chastain, the struggle to live up to her onscreen persona—to become a spokesperson, a role model, for an entire generation of girls—might all be worth it if she can still be herself. 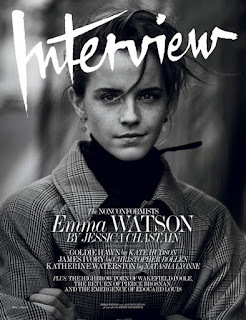 EMMA WATSON: I'm thrilled that you asked, because I didn't want things to get weird. I'm in the bath. In Paris. I didn't want you to hear swishing water and be like, "Uh, what are you doing?" I'm very relaxed. Where are you? WATSON: As long as there's a clear line across the floor so that you can actually get into bed at night, you're good. WATSON: I'm working. I just did the photo shoot for this with Peter Lindbergh, who I know you've shot with. I love him so much. He's the Ferrari of photographers—really thoughtful, engaged, and then boom boom boom. He is so quick. He does not mess around. During the day, I asked him, "What are your plans after this?" And he said, "I'm going to go do another meditation retreat." I was like, "Of course you meditate! You're like the Buddha. You're, like, one of the happiest people I've ever met." WATSON: Fashion is something that I love, and I find it to be so expressive and creative, and it's obviously a way into my characters, so I'm always deeply engaged with it. What I find difficult about photo shoots is the line between playing a character—you're being asked by the photographer to take on a role like you would in a movie—and being a fancier version of yourself. It's about finding that line between being spontaneous and open to direction, but also trying to explain to photographers that the "me" is often taken out of context because it has all of this other stuff attached to it. The fact that I was a child star is difficult for most people to understand, and it can be really conflicting for me. Photographers want to reinvent you, to take you somewhere else, to show you in a completely different way. They look at your previous work, and try to figure out what they can do to show a new side of you. WATSON: I think I am. It's one of the things that I struggle with, because the three of us—Dan[iel Radcliffe], Rupert [Grint], and I—were kids when we got cast in this fairy-tale series, and what happened to us was kind of a fantasy story in itself. Outside of the movies. So the story of my life has been of public interest, which is why I've been so passionate about having a private identity. When I step into a character, people have to be able to suspend their disbelief; they have to be able to divorce me from that girl. And not having everyone know every single intimate detail of my entire life is part of me trying to protect my ability to do my job well. Generally, I've been fortunate, like when Sofia Coppola offered me a role in The Bling Ring, which was so wonderfully different. Artists have given me a lot of freedom—have been able to imagine me in other ways—but it's something I am aware of, for sure. CHASTAIN: I've learned so much about acting and theater and films—life in general—from making mistakes. Do you feel the freedom to do that? CHASTAIN: That speech was such an important moment. I know it must be really stressful when so many people are telling you what is right for you, what you should be doing, but it seems to me that you've always listened to yourself and followed what you thought was right. Also, people will love you for your mistakes. I used to be terrified of making mistakes, and now I realize that if I make one, there's a lot of respect to be earned for throwing yourself 100 percent into something. WATSON: You need to be in your body, as painful and annoying as that is. No one wants to go through not feeling so great, but I do ultimately think it's essential. WATSON: I've been working with an organization called CAMFED, run by this amazing woman named Ann Cotton, which provides scholarships and money for families that traditionally would only send their sons to school. So Ann would find these girls, who were being taken out of school at 9, 10, 11, 12 years old, and try to help support them—not just through their secondary education, but with small business loans, all sorts of other things. I had been approached by a lot of charitable organizations, but I wanted to understand something from the inside out, not just dive straight in to being the public face of something, and I wanted to work with a small organization. So I took a trip to Zambia with a few friends, and we stayed in the school. I sat at the back of classes, and I spoke to the mothers of the daughters who were in the program and in the community, and I tried to understand the challenges. And then U.N. Women asked if I would be a Goodwill Ambassador for women and girls. I talk about it in the speech, but I remember watching Hillary Clinton's genius speech on women's rights, saying they were human rights, and they showed the audience, and there were almost exclusively women there. Why do we think that this conversation isn't something that all human beings need to hear? And they said, "We'd like you to make a speech." I thought, "Oh, god." I must have spent six months writing it, from journal entries that I'd been keeping since I was 12 or 13. WATSON: It's one of my favorite words. CHASTAIN: It's interesting that you say that, because that's what I think of when I think of you. CHASTAIN: I think in society there's a danger where everyone feels like they have to be the cool one. I don't feel that with you. You speak from your heart. And your open heart forced my heart to open. WATSON: Well, there's no higher honor or compliment you could have given me than using that word. No one likes feeling vulnerable and uncomfortable and weak. But I really have found that it's in those moments when I go there that there's a kind of magic. [The scholar and speaker] Brené Brown does an amazing TED talk about vulnerability, how it's the single most important way of connecting to other human beings. CHASTAIN: A lot of people talk about acting as lying—which I don't believe—because you're pretending to be someone else. WATSON: Oh, I'm the worst. WATSON: People sometimes talk about me as being a brand, having a strategy and whatever else. I wish. Seriously. I wish I had it together enough to have a strategy. But it's so instinctual. It usually comes down to two things: the person I'm working with—the director is really important to me—and a line in a script. There's usually one line that I read and I'm like, "Okay. I have to say this line. I have to tell this story." It's an instant click. And if there isn't that line, even if the story is great, I'm always a bit meh. Whenever I've gone against my instincts, it's been a bit of a disaster. If there's a script I'm considering, I will get everyone to read it. I will get my mom to read it, I will get my friends to read it, I'll get the person doing my manicure to read it. [laughs] I'm someone who really needs to talk things through. And then, obviously, I have a wonderful manager and agents, and I listen very carefully to what they have to say as well. But it's a bit of a free-for-all. I would honestly get my cat's opinion if I could. Anyway, if it's something I need to say, I say it. If it's something I feel genuinely connected to, then I'll do it. But I generally feel uncomfortable being the topic of conversation and try to steer away from that. WATSON: Completely. My friends know this about me, and they're like, "You realize that's ridiculous. You're doing totally the wrong thing." I'm aware that I'm kind of a paradox, and at times a bit ill-suited to my profession. But there's something that brings me back. There's something in me that feels like I have to do this, that this is what I'm meant to be doing. If I didn't feel this way, I wouldn't do it. But it's full of contradictions, for sure. WATSON: I remember being like, "Am I crazy? Am I masochistic? Why am I doing this to myself?" But one of my mentors was like, "In life, things happen. And as much as we can try to fight to make our lives a certain way, there are things that will keep coming back to you, and you have to follow your marching orders." I think our fears find us and force us to confront them over and over again. In terms of social media, it's a minefield! Technology is moving so fast right now. Everyone is scrambling around trying to understand what it means to have an avatar, how to live our lives on the internet, what it means for privacy, for citizens of a political universe. I think that we're trying to find rules now, as we speak, and it's difficult. But, like everything, the internet is an incredibly powerful force that needs governing—not to restrict our freedom, but to protect people. CHASTAIN: Yours is a very positive message on social media. I can't help but be grateful that young women have someone like you to look up to, someone who prioritizes education and authenticity over the empty calories of what social media can be. WATSON: Gosh, I can't even imagine what it's like for the generation after me, whose parents document their whole lives as they grow up. It's kind of crazy to think about how quickly things are changing. Doing this movie, The Circle, made me think about all of this in so much more detail. I read the book first, and I could not stop thinking about it. It's not like a dystopian future—it could be tomorrow. Someone recently said he thought it was The Truman Show meets The Graduate with a dash of Kardashians. And I said I would describe the movie as The Social Network meets All About Eve meets Panic Room. The Social Network because it deals with how technology intersects with basic human needs: to feel loved, to feel seen, to feel a connection, to feel that you belong. All About Eve because it deals with the complexity of the female relationship in a patriarchal world; usually there's only one woman or two women in a boardroom. And Panic Room because it's intense. WATSON: Oh my god, yes. I set even more boundaries than I had before between my public and my private lives. It made me think a lot about what I would do if I had children. A lot of children of this generation have their entire lives made public before they have a say about what they would want. I think it should always be a choice. I love social media, and I love what it can do and how it brings people together, but used in the wrong way, it's incredibly dangerous. And, increasingly, our attention is our most important resource. Before the press tour, I deleted my e-mail app from my phone and really tried to create serious boundaries from it, because it is addictive. We need to make sure that we are using technology, and technology is not using us. CHASTAIN: Besides deleting your e-mail, what do you do to relax? When no one's watching, when no one's thinking about you as a movie star or as a role model, what do you like to do? WATSON: When people call me a role model it puts the fear of god into me, because I feel like I'm destined to fail. WATSON: Very true. Steve Jobs has a great speech where he talks about how the wrong turns in his life truly set him on the path that he needed to be on. Anyway, what do I do? I bake. I'm pretty competitive about my chocolate chip banana bread. I don't think anyone can believe how good it is. It's really on another level. And I hang out with my cat. I love to travel. I went on safari before I did my tour, which I loved. I love to dance. I'm the girl who will get up and dance with zero alcohol in her system. You need give me no excuse. A great song comes on and I'm there; it's happening. WATSON: I like a lot of hip-hop. Everyone's always like, "Really? You know all the words to this?" I'm like, "Yes, I do." And Beyoncé, Gaga. CHASTAIN: You've got to get out of the bathtub now, because you're going to turn into a raisin.